Last week, Bruce Foster, a renowned paper engineer, graphic designer and illustrator spent a day with the Structural Graphics team at their Essex, CT headquarters, enthralling them with a sampling of his incredible body of published pop-up designs. 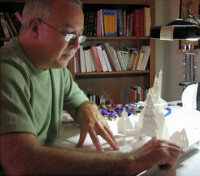 Some of Foster’s most notable work includes pop-up designs for the set of the Disney film, Enchanted and among many published titles, a book for the Harry Potter movie series entitled, Harry Potter, A Pop-Up Book. Structural Graphics came to know Foster last year when he was commissioned by a major New York City-based advertising agency to design two complex pop-ups in high profile coffee table books for an international real estate developer. Seeking a production partner for the dimensional inserts, he reached out to Structural Graphics, and together we collaborated to bring the project to market. Foster’s love affair with paper began when he was a young painter with an eye for sculpture. After studying art in college, he began a career in graphic design with an interest in 3D design concepts. Foster spent years in packaging and trade design until he was able to explore dimensional design more fully when a 3D project for Minute Maid Foods led to freelance opportunities with major clients. Since then, Foster has been sharing his pop-up design talents in books, film, promotional print campaigns and art exhibitions around the world, including an upcoming visit to Seoul, South Korea to speak and lead workshops. Foster’s process for creating begins with a few pencil sketches, allowing him to test the ideas he imagines in his mind. He works closely with the text and builds his cinema, spending hours with paper, scissors and glue as he constructs dummy designs that are eventually approved by collaborators and shipped off to a printer who produces the publication. Structural Graphics employs its own staff of paper engineers like Foster who create memorable and meaningful experiences for consumers with dimensional designs. The effect is worthwhile, since 57 percent of 25 to 34 year-olds have made a purchase as a result of a direct mail offer according to an ExactTarget 2012 channel preference survey. His most recent projects include America’s National Parks, a pop-up book inspired by a shared interest in the outdoors with Publisher and writer Don Compton. A portion of the sales will go toward the National Parks Conservation Association. Foster is also working on game board designs for Hasbro Games, one of the biggest toy makers in the world. Learn more about Bruce Foster at paperpops.com.